Don't Sit on the Slat fence... choose one! Gap, no gap, privacy or feature… there is an Aluminium Slat Fence for you. Eurowood’s Ezi Screen is an innovative, easy-to-install, aluminium slat screening system that offers the latest in architectural style. Ezi Screen is tough, long lasting, low maintenance and can be adapted to suit a wide variety of fences, screens and aluminium slats. We keep plenty of our timber look powder coated aluminium fencing in stock. This means we can get aluminium slats delivered quick and easy. Plus our easy to use PATENTED PUSHLOC SYSTEM saves you time, labour and overhead costs. A non-weld PATENTED PUSHLOC SYSTEM is so easy. Simply choose your blade spacing and fence height. With a great range of contemporary colours available, you’ll find a timber look powder coated aluminium fencing solution that’s just right for you in half the time with half the effort. Commercial slat fencing needs to be hard wearing and durable because of the volume of traffic and maintenance performed. The quality of Eurowoods Aluminium slat fencing and finish is designed to withstand commercial use. 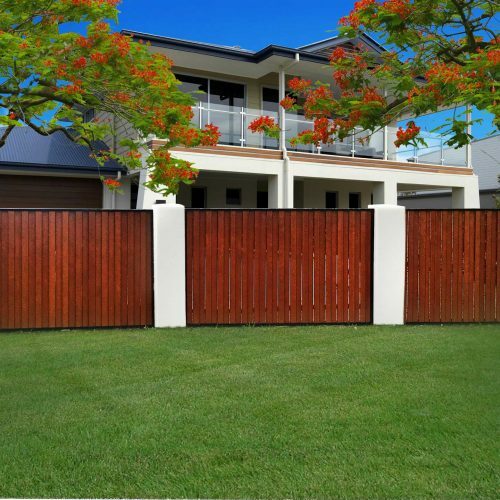 Eurowood residential Aluminium Fencing options are extremely popular in the market due to their ease of install. They are low maintenance and Affordable Aluminium Slat Fencing system. Perfect for DIY Fencing options. Our custom Aluminium slat fencing comes in a number of different size slats and framing combinations as well as colours and design. Full timber imaged or powder coated. Can be manufactured and installed onsite for quicker install times. Take a look at our colour range. 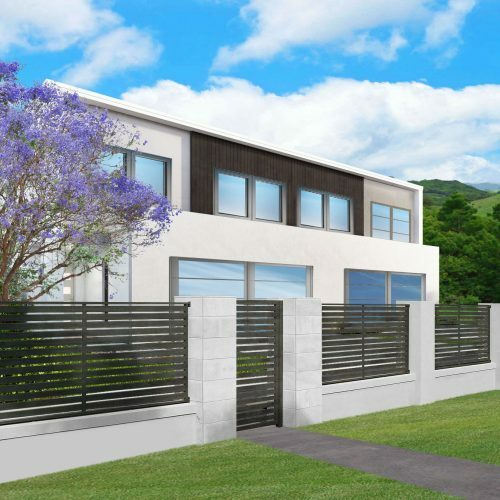 Our Aluminium Slat Fence systems can be made to architectural / designer plans and specifications. We are also able to design, make and install Aluminium Fencing according to your individual requirements and budget. Fully customisable Aluminium Gates cut to size. We have the perfect aluminium driveway gates with horizontal or vertical, louvre or slat options. If you need a timber gate or a metal gate, our variety of gates will have the perfect gate solution. Just take a look at the benefits of wood look, timber look and wood grain gates. 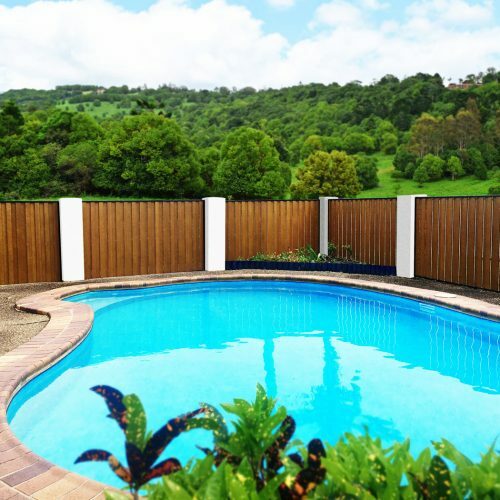 Our range of aluminium pool fences are the perfect solution for keeping your pool area safe and secure. Contact us for our aluminium pool fence range. Low maintenance powder coated aluminium privacy screens that not only look fantastic but will outlast timber many years over. You can choose any standard powdercoat colour or from one of our wood grain finishes. We have a wide variety of slat widths to choose from. When you choose our slat fence and privacy screen systems you will receive a quality product made here in Australia. Request a sample pack today! The Eurowood Ezi fence Aluminium Slat fencing and screening system is easy to assemble. We use pre-machined frames at various spacings which incorporate our PATENTED PUSHLOC SYSTEM. This eliminates the need for unnecessary and unsightly fixings including screws. It also gives a high-quality finish unlike other systems as there is no snap infill pieces or gaps. Fully customisable Aluminium Gates cut to size. We have the perfect aluminium driveway gates with horizontal or vertical, louvre or slat options. Our range of aluminium pool fences are the perfect solution for keeping your pool area safe and secure. Contact us for our aluminium pool range. Save time, effort & money… Deal direct!